Our Metropol Hostel Berlin is located in the unique, vibrant and alternative district of Kreuzberg. The hostel is a great place at a low price for travelers who want to enjoy the city and get inspired by the unique vibrations of its surrounding, close by all main tourist attractions like the Potsdamer Platz , Check Point Charlie or Brandenburger Tor! Besides the typical sharp but lovable Berlin tongue you will find a multicultural flair and night life just around the corner. We are situated in a quiet backyard with a view towards the TV tower on Alexanderplatz. You will reach us directly by the underground station in front of our hostel quick and easy from all sides of Berlin (Mehringdamm U6/U7). We have the most famous dining possibilities of Berlin directly in front of the house, the super delicious Mustafas vegetable Kebab and the typical Berliner dish Curry Wurst @ Curry 36. Just around the corner the very charming Bergmannkiez will enchant you with its international cafés, restaurants and bars. Going out is a simple task, no matter if you like Electro- Rock, Pop or Jazz. Come to the hippest district in Berlin and enjoy with us every minute of your stay! Our single and double rooms are with bathroom, TV and breakfast! Our spacious dorm rooms are ideal for small and big groups and can be booked with their own or shared bathroom - breakfast included. All you need for a relaxed, adventurous trip to the capital city in Germany. 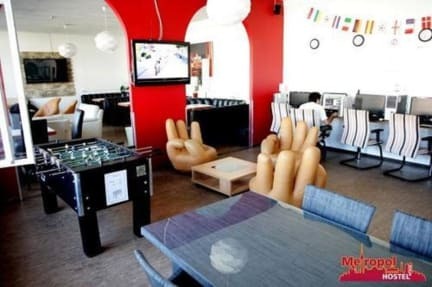 In our lobby you can enjoy a drink at the bar, a table soccer match with new backpacker friends, hang out on our comfortable couches, or surf the net. Our multilingual staff are happy to provide you with tips for hip clubs and restaurants all over Berlin. Linen are charged one time only 4.00 EUR per stay in dorm rooms. Due to sanitary reasons, using your own sleeping bags is not permitted and the hostels linen has to be used. Clean / crowded / good service / etc. Really great hostel. Loveeddd the complimentary breakfast! Location was not in the heart of the city but the subway was right at the doorstep. Cool neighbourhood with a bunch of cool thriftshops and restaurants. Not a bad hostel! The hostel is placed perfectly near kebab, coffee shops, and currywurst stands, as well as with the public transport system of Berlin. The main drawbacks were the lockers in the rooms were difficult to get locked, some of which would open no matter what type of locking mechanism there was in place. Overall not a bad spot, the hostel's staff were very helpful and attentive with my friends and I too, speaking good English! Decent place with decent breakfast but very impersonal. More like a cheap hotel than a hostel. No kitchen. Issues with wifi. Issues with lockers. Experienced blocked drains and flooding in two seperate bathrooms.